I found this photograph on the blog of an American Anglican priest in the Fort Worth diocese. I rather like it. I have lost the reference to his blog, but I thought of linking with it because it has a lot of interesting stuff. 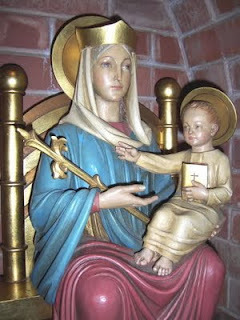 On Saturday I am off to Walsingham for the Leeds Diocesan Pilgrimage. It's just a day and quite hectic, but the experience of community is worth it. I am looking forward to it. I usually see people from parishes I have served in and others who I know because of Marian devotions. I have publicized Walsingham a bit more this year with the result that some people are talking about going next year for an overnight stay. I hope you enjoy your day at Walsingham. I've been there a couple of times - very prayerful and peaceful days.